ST. GEORGE – Things get a bit tricky when Lane Wagner is around, and if you dine at the Brick Oven restaurant in St. George on any given Friday or Saturday night, you’ll see it for yourself. “It’s something unique down here in St. George,” Wagner said. 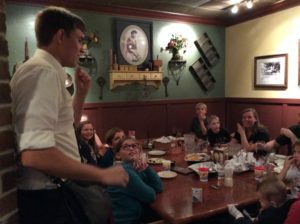 Customers have noticed Wagner wandering Brick Oven as they enjoy their pizza and pasta, and the lucky ones get to see him perform his up-close magic as they conclude their meals. Most are surprised to have a well-dressed stranger approach their table and ask if they’d like to see some magic tricks — but by the time he’s finished, Wagner has generally acquired some new fans and has left his short-term audiences smiling. 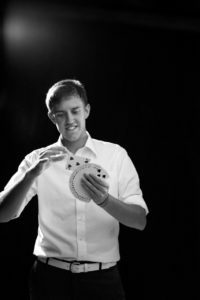 Performing for tips and the pure joy of doing magic for others when he’s at the restaurant, Wagner also performs private shows and is steadily making a name for himself as Southern Utah’s “magic man.” He has performed at a variety of local gatherings, from teenager birthday parties to shows for Boy Scout groups and company parties for local businesses. 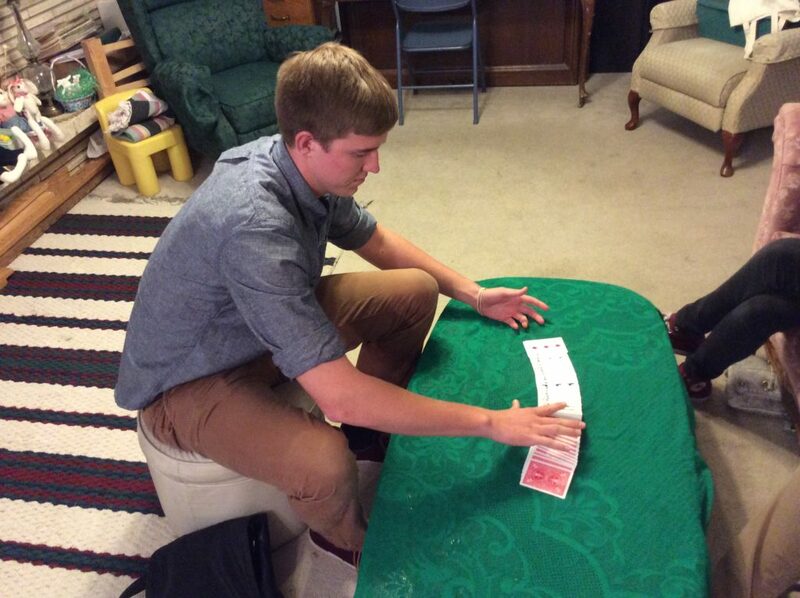 Wagner is a Dixie State University student by day and a professional magician by night. He first got his start in magic as a teenager at Desert Hills Middle School in St. George. 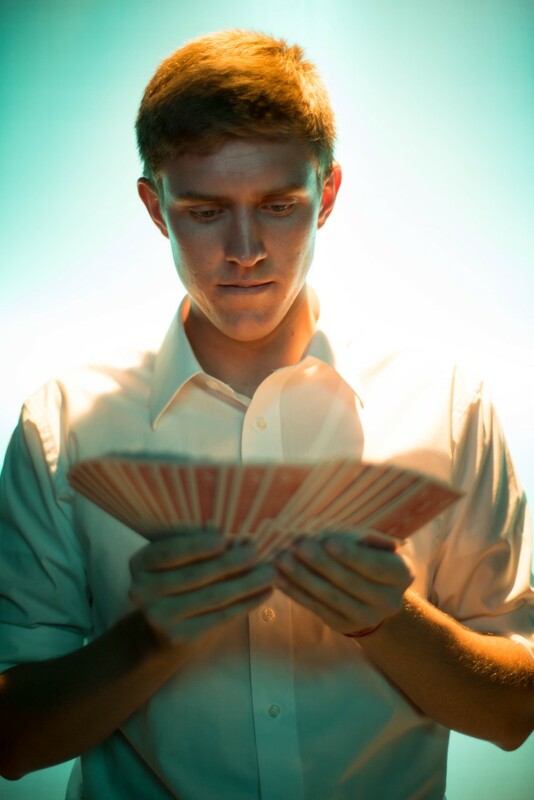 He continued honing his sleight-of-hand skills, and when he got older, he began working as a waiter at Brick Oven. He would occasionally perform magic tricks for his co-workers just for fun, and he said some of them encouraged him to start doing tricks for the customers, as well. So he did. Wagner soon discovered that not only did his customers enjoy a bit of magic with their dinner, but performing for patrons also tended to increase the tip amounts they left behind. Wagner was away from Southern Utah for two years, serving a mission for The Church of Jesus Christ of Latter-day Saints, but he continued practicing magic as a missionary. He said he would sometimes perform tricks for his missionary companions and the families they taught, doing things like making coins vanish through religious pamphlets and come out the other side. “My technical skill definitely increased a lot while I was out on my mission,” Wagner said. When he returned home to the St. George area, Wagner said he approached a manager at Brick Oven, his former workplace, to see if the restaurant would allow him to come back — but not as a waiter this time. Wagner said he hopes to also get his foot in the door at some other local restaurants. His goal is to eventually work directly for the restaurants as a performer, rather than working for tips. Like most professional magicians, Wagner would also love to have his own show someday. He said he’s getting more and more into the mentalism and mind-reading side of magic. Community members can see Wagner perform at Brick Oven, located at 1410 E. St. George Blvd. in St. George, between about 5 p.m. and 9 p.m. most Friday and Saturdays. Dumpster’s on a roll! No stopping him now. Comedy genius!